Hangzhou, the city blessed with natural landscape & location is a popular destination that has attracted many. Despite many negative news and views about their people , I feel that china is still worth a visit. & travelling has change my views on that.
" Everyone sins differently & who are we to judge them? " Anyway the main focus of our trip was to explore Hangzhou. Well known for its scenery, Westlake, has won the heart of many. It was awarded as UNESCO World Heritage in 2011. 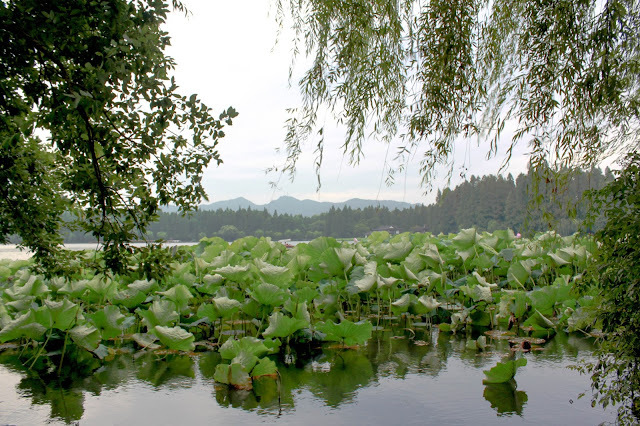 Located in the Zhejiang Province, H & I decided to include other places such as Wuzhen, Shanghai & Suzhou. As we were doing our research for this trip, i realise that there are limited information being shared in google. Thus we switch our research engine to China Baidu & it was definitely a good decision. We visited places that were highly recommended by travellers as well as path that are beaten off the track. The only thing we didn't realize was accessibility to Google/Facebook. H had saved all the location in his phone and could not access to play store to download VPN in China. Thus before setting off to remember to save your map or download VPN if you want access to Facebook & google. We took a taxi from Xiaoshan International Airport Taxi Stand to Holiday Inn Hangzhou at Jian Guo Bei Lu and it cost us about 140 rmb and 40 minutes. Stayed in holiday Inn hangzhou for three night for $78 per night and i thought everything was fine except for its location. The king size bed is huge and comfortable but the toilets are old. Although the hotel does not provide complimentary wifi, the manger was nice to give us for free. I wouldn't recommend anyone to stay there if you want to travel to westlake. The location is out of the way. Although it is quite near to the railway station but it takes about 30 - 40 minute to walk there . Plus that area is still under construction. Grandma ( 外婆家）restaurant was recommended to us by a local friend. While I was doing research on food, Grandma Place was highly recommended by tripadvisor & the Baidu. We visited the outlet near Hangzhou railway station as it has lesser queue compare to the outlet at westlake. If you are hungry and do not want to queue, this is the place! Unlike traditional Chinese food which are full of flavours, Dragon Well Tea shrimp is the opposite. It is light and has a lingering fragrance of the tea. The shrimps are juicy and has the same texture as the prawns you found in Chinese dim sum. Definitely one of my favourite! H's favourite. He loves the braised pork. The meat was tender and juicy. Unlike others, the braise meat from Grandma was restaurant was not too oily. Also, the braise meat was cook with salted fish in the claypot, allowing the braise meat to have a rich flavour! We ordered the braise duck & have it to be eaten warm. I would have it cold if H wasn't there. I love it! However I wouldn't recommend it to people who does not like to eat meat with lots of bones around as it can be quite difficult to enjoy the duck if you do not know how to eat it. The sauce of the duck was not overly salty and leaves a sweet taste at the end. 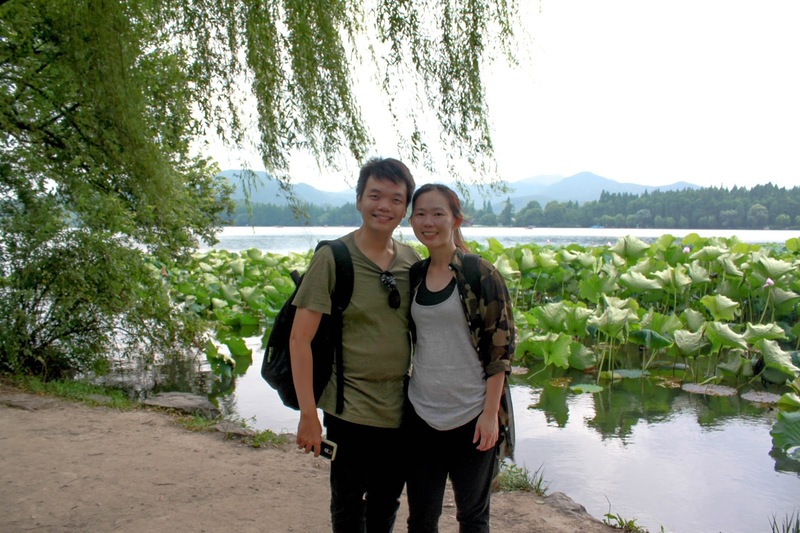 To kick start exploring westlake, we decided to start our trail from Westlake museum. Westlake Museum gave us a good understanding of westlake and how we can navigate from there. The museum is located at the east of the lake. In order to get to west of westlake, there are several option to choose from. First, one can ride a bicycle around the lake, This method is highly recommended by travelers from trip advisor. Plus there are several bicycle kiosk that allows you to rent the bicycle. Second, the easy way out, is by taking a taxi/cab (30 minutes ride) from the museum to south west of the lake. San tang Ying yue pool is located in the middle of westlake, Xiao Ying Island. The pool used to be the one of the garden that the king would visit. In the small island, you can view the three pool mirroring the moon, where the reflection of the moon in the pool is said to be exceptionally beautiful during full moon. After exploring the westlake, we took a break at Yang's dumpling before heading to yue museum. There are a few restaurant chain located opposite Yue 's Museum & my favorite among all was Yang's Dumpling. Tried once and it has become my favorite local delight in hangzhou. I had the dumpling and it was so good that i wouldn't mind having 10 of it as my lunch! If you are familiar with the Chinese history, you will know about yue general & how he fought. "精忠报国 serve the country with the utmost loyalty "
Took a cab to Hefang street and spend our night in looking for food. Although lots of food street but nothing appealing caught our eyes and the street is design for tourist because most of the shop are repetitive. Nonetheless, H & I had a good night.